Building your online presence doesn't just stop on launching a website. Maintaining it is not an easy task as well. To be successful, you have to be patient and persistent in growing your traffic. But having a high-traffic website is no good at all if you can't keep your visitors engaged. In fact, user behavior can affect your search engine ranking. For example, when visitors went to your page then leave right away without visiting other pages on your site, it signals Google that your content didn't add value that's why they leave. So how can this affect your website? As a result, Google won't show your page on top of the search engine results. This means the number of your website traffic may shrink. You'll have a less number of visitors to convert that may result in the decrease in your sales. You see? It’s a snowball effect. Analyzing bounce rates is crucial in every website. It’s important that website owners and marketers are familiar with bounce rates and how to manage them. High bounce rates may be a cause of a poor web design, slow loading pages, and too many pop-ups among others. Without knowing the real cause why users are leaving your site, you won’t know the right approach on how to deal with it. 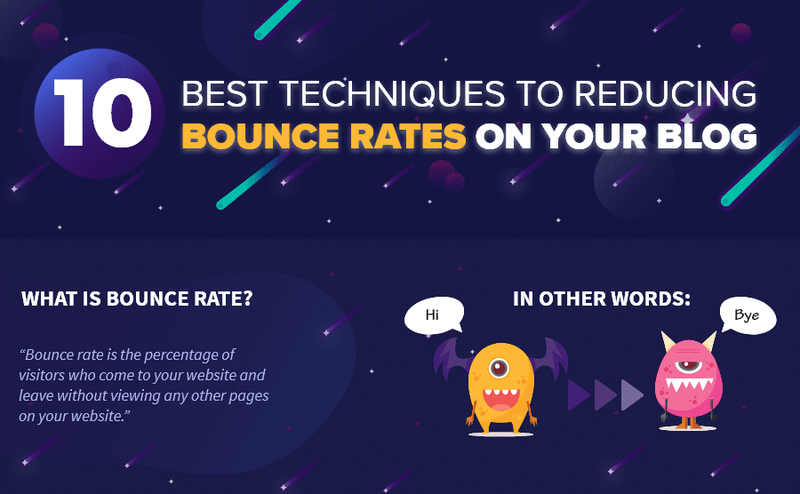 The infographic below from Devrix explains what bounce rate is in a nutshell. You’ll find the types of bounce rates and the average percentage in different kinds of websites. Most importantly, you’ll find the effective ways on how you can reduce the bounce rate on your blog.